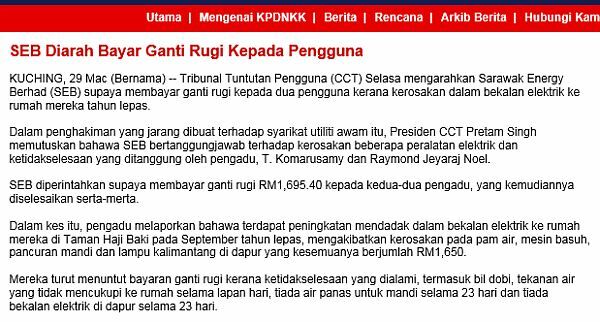 I was combing for information in the Electricity Supply Act 1990 to see if there is a clause to give consumers the rights to claim from the utility companies - TNB, SESB, SEB - for electrical appliances and equipment damages due to voltage surges and dips in the power supply system. I am currently working on a claim against SESB for faulty equipment due to over voltage at their 415V LV supply system with no favourable result so far. I could not find the pertinent clause, but would appreciate it very much if anyone can point me to it. In the SEB case, the consumers have written earlier to the power utility company but their complaints went unanswered and that was when they decided to approach Consumer Claims Tribunal Malaysia. So there. Know your rights and play your role, and plug some holes in your pocket. 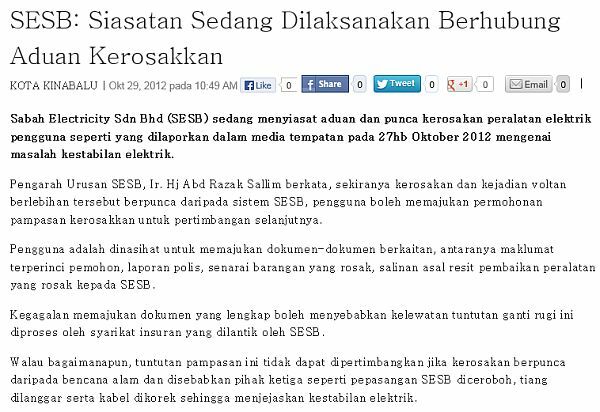 TheGreenMechanics: The Acts pertaining to electricity supply seem to be not so friendly when it come helping the consumers. Aren't consumers the backbone for the existence of the power utility companies? Someone can point me to a clause in the act that can save my day, please? Same apply to Astro. Can we claim if service is interrupted using raining days. I was just wondering if it was right to use compensation in the following sentence? The employer rewarded the customer a compensation of £10 for his (the employer's) constant mistakes and mishandling of the problem. So basically someone got £10 after being messed about my a company, the £10 is compensation right? @Motorcycle - you already answered it in your sentence.